This is a blog post about choosing to hang out with yourself. Not always, but sometimes. About being an extrovert loving to be surrounded by family and friends, but still appreciating alone-time. About daring to feel things and notice thoughts that appear when you cut of the buzz that is constantly around. There was I time when being at home, all alone, watching a movie a Friday night was a “failure” and something that made me feel extremely lonely. However, if I would do the exact same thing but having someone sitting there next to me in the sofa it would be a “casual movie night at home”, and furthermore a legit Friday evening activity. My guess is that lots of people out there can relate to that. Today I know why I did have that feeling; because I was depending on - and referring to - my own (and probably many others with me) thoughts of how somethings “should be” to be good enough. What a Friday night should look like. I did’t dare to be with only me, I didn’t believe that my own company would be good enough or that it would give me enough satisfaction. And I was for sure afraid of feeling lonely. Fast forward to when I realised it was a choice that I did for me, and that during the hours I spent with myself - without input from my phone or computer or other (even loved) people - I really got time to getting to know myself. And to become my own best friend. I’m an extrovert person, but that doesn’t mean that I don’t highly value spending time with just myself. Since that day I try to make room for at least a couple of “Thess dates” every week. And I love those dates. No matter if you’re in a relationship, have roomies or live by yourself, some time spent alone every now and then is brilliant and will do you good. Trust me! 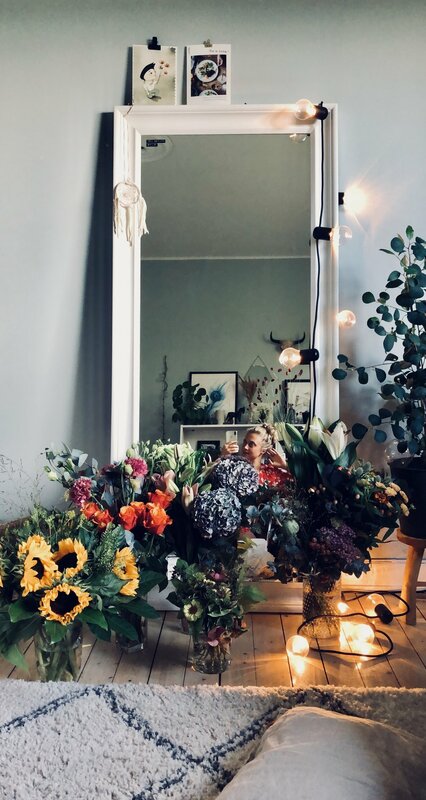 To celebrate the whole “dating yourself-thing I’ve gathered a few pros to help you put a self date in the calendar ASAP + some of my best ideas for making your alone time really great. ENJOY! Your relationship with yourself is just as meaningful as the relationships to the people around you. Might be even more meaningful to be honest. When you know yourself, your values, learn about your strengths and weaknesses, what gets you going and what triggers you it will be much easier to approach other people, situations and decisions in life. Being with yourself, cutting of the buzz, will give you time to discover what you like, what you want to do, what your passions are, what you need more of and what you don’t want in your life. We live in a world where we get stimulated from so many directions all. the. time. People, media, magazines - even such a thing as walking in a grocery store seeing all the options at you hand. Cutting of all (or, as much as possible anyway) the buzz every now and then will do you real good. It might feel a bit scary at first, because you’ll most likely have room to feel and think and notice other things that you normally don’t. But it’s nice. In other words; developing that relationship is something that could really benefit you in so many ways. Try being with yourself without buzz such as emails, social media and text messages, things that you most likely mindlessly consume every single day. Sometimes those buzz-things might even give you a feeling of stress/being inadequate. Plus, it’s a nice feeling knowing you don’t have to be available every singe minute of every day. PI’ve found that putting my phone on flight mode is the most effective way to practise this. It gives you time to just be and think more clearly, without the impact of others and other things. Set time to clarify your thoughts - and write them down!! Journaling is the bomb. And it doesn’t have to be a memoar - sporadic words that comes to you also does the trick. Make plans and set up dates with yourself - just like you would do with a close friend, family member or your partner. Otherwise, being by yourself might end up being something that happens when you “don’t have any other plans”, which is more likely you make you feel lonely than if you would have a “spa date with me” set up in the calender. Make plans for a Friday night in with popcorn and a good book, or a flight mode stroll in the woods a Tuesday after work. No biggie, only things that you like and would normally do with someone else! Tidy up at home, light candles and put on your favourite comfy clothes. Set up a stack of your favourite books (would be cookbooks in my case) in your favourite spot in your home - or whatever you need to do to create a space that calms you down. Other then my apartment I find the woods or the sea to be one such place. Remember times when you were younger and could sit and draw, build with lego, play with toys, bake or play sports for hours without getting tired? All those things are just a few different ways to be creative. And being creative is really something special; while being creative you are likely to find yourself in a meditative state without even thinking about it. We receive immediate pleasure when being creative, to mention a few pros it’s said to reduce stress and anxiety, allow you to express yourself, increase positive emotions and give you a sense of purpose. Ask yourself - how do you get creative today? It doesn’t matter if it’s in the kitchen, when building something, writing music, drawing, dancing, redecorating etc. Give yourself time to explore what gets your creativity going! Lose yourself in whatever makes you happy. This whole thing, about spending time with yourself, is a way of self care really - but as I’m a big fan of all sorts of self care routines (including dry brushing, natural facials, massages, oil, adaptogens, meditation etc) this ones gets a heading on it’s own.